The criteria your prospects use to decide your fate. How to gain access to crazy-busy prospects. How to keep the decision from grinding to a screeching halt. 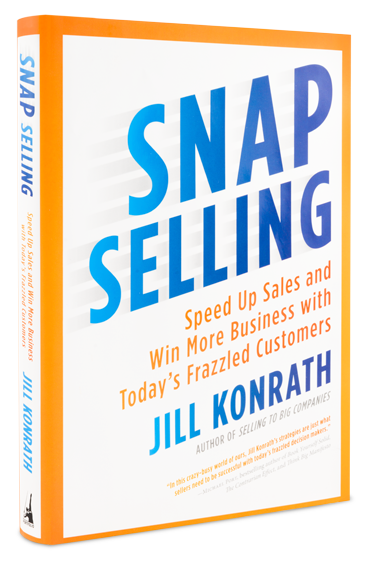 Jill addresses the realities of selling today and the sea change that has taken place. SNAP Selling lays out a step-by-step plan on how to be relevant, add value and move the sales process forward. You’ll want to keep this book on your desk. Trish Bertuzzi President, The Bridge Group, Inc.
At a time when executives face increased pressure to get more done in less time, Jill Konrath shows salespeople how to capture and keep the attention of these key decision makers. SNAP Selling is a real world book from a real world expert. SNAP is Straightforward, No-nonsense, Attuned and Practical. Jill accurately reflects the realities of many buyers and offers helpful means of cutting through the noise and making the buyer/seller relationship work better for both parties.